The prebuilt and wishlist links aren’t working for me anymore. Also cannot see the 2080 for the same prices or near. I updated the builds yesterday. For the links not working, I’m guessing you might be outside of the US? I have it set up to where it will redirect visitors outside of the US to the appropriate Amazon store (UK, Canada, Germany, Australia, etc. ), but it doesn’t always work properly as the same exact items/models that are available on Amazon’s US website aren’t always available on the overseas Amazon websites. I think the price of the RTX 2080 has gone up significantly and the multiple item amazon links are no longer working for me. Any ideas? to have the same config, it’ll cost around 2.500€ for me, did the price change that much, or is it something related to the region/country ? I am looking at the $1250 system, except I might go with the 1870 instead… Will it play Oculus Rift VR games like Robo Recall and Dead and Buried? I dont want to skimp and end up under-powered. I know nothing about VR except I just played it and am hooked! Excellent review great choice great selection. Thanks I owe you one. 16 GB Ram 8 GB GPU Intel core. $1,000. anyway, I was asking if this coolant system would fit as I am paranoid that I will spend all my money and end up unable to assemble them. Hey Morgan, yes, that AIO cooler will work with the $1,250 build and the Thermaltake G21 case that it comes with. You’ll have to install it on the front panel of the case, though. Hey is the 1,000 build good enough for me to run games like destiny 2 and stream at the same time? im converting from console here! lol so much reseaerch, please help. EVGA CLC 280 comes with Thermal paste. Is there any reason I need the EGC High-Performance Thermal Paste Compound.? On the 2K build, you include the EVGA CLC 280 Liquid/Water CPU Cooler, RGB LED Cooling 400-HY-CL28-V. I was told that AIO Water Coolers are “better”. What are your thoughts and if you agree which one would you recommend? Hmmm, this might have been a stupid question. I don’t know much about Liquid cooling. Sorry for the delay on this. The EVGA CLC is an AIO water cooler. There’s really only two types of liquid cooling: AIOs and custom loops. AIOs come ready to use right out of the box, whereas custom loops have to be assembled. You can achieve better cooling results with the right custom loop, but AIO coolers are much easier for the average user to utilize. 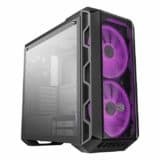 Your 2k builds includes the Phanteks Enthoo Pro case. Is there a difference (other than color) between the white one you sourced (Phanteks Enthoo Pro Full Tower Chassis PH-ES614P_WT White) and the black one (Phanteks Enthoo Pro Full Tower Chassis with Window Cases PH-ES614P_BK)? Hey David, thanks for commenting. Yep, they’re both the same case, minus the color! Is there any differences between the different 1070ti “versions”? There’s the founders edition, and then there’s also other versions from different companies. In the $1250 build you recommended one by gigabyte, but there are cheaper options on Amazon. Is there physical differences that will affect performance or should I go by lower price? Hey Brandon, there are some physical differences, mainly on the cooler on the card. There’s also differences on the stock clock speeds of the different versions of the cards. Typically, the third party options are better than the Founder’s Edition. But, for the most part, in terms of performance, the cards either all perform fairly similar out of the box, or they can be overclocked to match other third party offerings. I’m planning on building a High-end ($1750-2000) gaming rig that you recommend here (I have a set-up from 8-9 years back, so it’s time to upgrade), but was wondering if there are any parts I could reuse. I have upgraded the RAM quite recently (last year) and have some SSD’s which are fine. I read online that the memory can be quite the hassle to reuse, because of compatibility issues, but don’t see where to check that. Do you know? Hi Yuri, thanks for commenting! The RAM probably won’t work, because if you’re going to spend all that money on a new system, I’d assume you’d be getting a new processor/motherboard combo that utilizes DDR4 memory. And, if your system is 8-9 years old, then you probably have DDR3 RAM in it. Unfortunately, DDR3 RAM isn’t compatible with motherboards that use DDR4 RAM. The SSDs, though, you can reuse. You could also potentially reuse your power supply, any optical drives, and your case. For the power supply and case, it would just be a matter of whether or not they’d be compatible with your newer components. Thanks for you reply, Brent. I bought some DDR4 RAM just a Year back, so should be fine than, I guess. I read on a Dutch tech site (I’m from there) that some Ryzen processors have issues with some RAM’s, but will check, if I decide on a Ryzen, with the manufacturer. Will then reuse SSD’s, HDD’s, RAM, but that will be all I think. I’ve been using your $800 build for 3 years now and I’m looking to upgrade. Your $1,000 uses a PNY GeForce GTX 1060 6GB Graphics Card and I was wondering what the pros of using this card over the ASUS GeForce GTX 1060 6GB Dual-fan OC Edition Dual Graphics Card. The Asus is quite a bit cheaper and I’m not finding much of a difference in my research. Thanks as always for the help!! Hey David, thanks for stopping back by and commenting. As always thanks for the help! Yep, I think for that price and for your setup (running a GTX 1060), the MasterWatt 550 is a good option. Both are optional, but if you need to use CDs at all (for installing operating system via disk instead of usb) you need one. Also if you’re going to use wifi instead/alongside ethernet you will need the wifi card. Both are only around $20 though, so not too expensive at least. Hope I helped! My build is very similar to the $1000 build. I got parts from a prebuilt PC that had an i7-6700 so I’m using that for my CPU, and an MSI H270m Bazooka motherboard. I also have a Deepcool Gammaxx aftermarket cooler for the i7-6700 for aesthetics mainly. I was considering getting the AMD Ryzen 2600x along with the B350 motherboard. My current CPU does not support my 2400 memory speed from my ram. Is it even worth upgrading to these components? Do I need a HDD for the $1000 build, or can I go with just the SSD? I’m unfamiliar with that type of SSD (that looks like memory), so I’m not sure exactly how it works. Hey Chris! Nope, you don’t have to have the HDD and you can just stick with the SSD. The HDD serves as a secondary drive that has a ton of space, whereas the SSD is significantly faster (improves boot times, load times, and will make your system perform much faster outside of gaming). That is the newest SSD format. Rather than using SATA it uses PCIe NVME (which is much faster) to transfer data. Hey,do I need to buy an ODD or wifi card for these builds? Thanks for the guides. I’ve basically ordered all of the parts for the 1,250 version including keyboard, mouse, and a copy of Windows 10. I also purchased a 1440, 144hz, g-sync monitor to go with. Are there any kind of cooler or cords I need to buy to make all this work? Hi Tim, I hope you’re doing well. But the stock cooler is a solid option if you don’t want to push your 1600 to the extreme. But, really, those probably won’t be necessary unless you’re hooking up more than a couple of SATA drives. Hope this helps! Let me know if you have any other questions. Good luck with the build and have fun putting it together! Appreciate the quick reply! I have no idea at this point whether I’m going to attempt to overclock it or not – this is my first build and so I’m not entirely sure what the real benefit of over-clocking is. Any recommended guides I should check out about that? If not, I can always google if it gets to that point. I went ahead and ordered some extra DisplayPort cables just incase. Thanks again.